"Look no further: you'll want to add these savory bison meatballs to every festive menu. The seasonings used in this recipe naturally enhance the meat's subtle taste. A must try!" Mix bison, mustard, oregano, cumin, onion powder, paprika, sage, and celery salt together in a bowl. Form meatballs approximately 1 1/2-inch diameter in size. Heat olive oil in a non-stick skillet over medium-low heat, swirling to cover bottom of the skillet. Add meatballs and cook undisturbed, about 4 minutes. Continue to cook, turning meatballs until browned evenly on all sides, about 6 minutes more. An instant-read thermometer inserted into the center should read at least 160 degrees F (70 degrees C). See how to make a lower-fat version of cocktail meatballs. 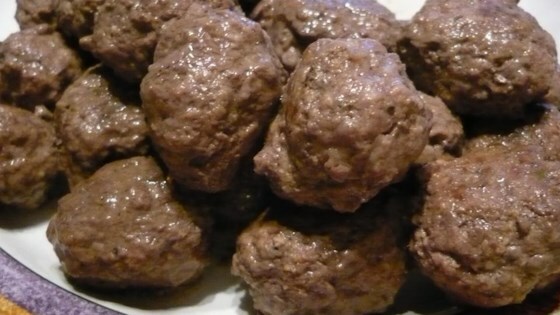 These meatballs are best when they are cooked at a medium-low temperature, uncovered. Do not sear. I cooked in the oven, 10 min, turned then about 10 minutes more on 325*. good flavor, remembering it is bison, some gaminess to it. wonderful not having to add egg and bread crumbs. So delicious. Also very quick and easy to make. Just made these for dinner with a tomato gravy and they were a huge hit with my family! Absolutely delicious! Absolutely delicious and easy to make. Will be making again soon. Very nice mild flavor. I baked mine at 325 - cook 10 minutes - turn - cook 10 minutes more. Super easy and very tender meatballs.